Dutch were well known for centuries for their abilities to build precise instruments and mastering the art of producing fine diamonds. The Netherlands is famous also of their many Nobel prize laureates in sciences. Right now, this small country is the world leader in numerous scientific developments. Recently, a group working at Delft Institute of Microelectronics and Submicron Technology (DIMES) carried novatory experiments on electrical properties of single molecules of DNA - a research important both for molecular biologists, chemists, and physicists. Cees Dekker, one of the researches from DIMES, writes about the problems encountered: "First, one needs to fabricate electrodes separated by an ultrasmall distance, say 5 nanometer (1 nanometer is a 1 millionth part of millimeter), which is beyond the resolution limit of standard electron beam lithography. Second, the molecule should be positioned between the electrodes in such a way that it bridges the electrodes electrically." The first obstacle had been overcome by creating platinum electrodes with traditional lithographic methods, separated 25 nm apart. After that, additional atoms of platinum were sputtered, reducing gradually the distance between the electrodes to 5 nm only. Positioning of a single DNA molecule between electrodes was performed by using electrostatic methods. 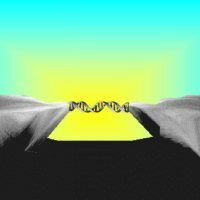 That experimental setup allowed finally to reveal for the first time electrical properties of DNA, creating potentially a new, powerful spectroscopic technique. The first measurements showed that DNA molecules behave like a semiconductor, with typical band-gap of several volts. Their electrical characteristics are similar to diodes, with strongly nonlinear current-voltage dependence and even negative differential resistance in some ranges of voltage applied. Measurements were performed at ambient conditions as well as in vacuum and at cryogenic temperatures. Currently, studies of varying parameters such as the DNA sequence, length, and environment are continued. There is a hope already for creating a new sort of bio-electronics, e.g. for using DNA-metal structures as biosensors and other devices. Figure shows an artists vision of the experiment. It is copyrighted by DIMES, Delft Institute of Technology.